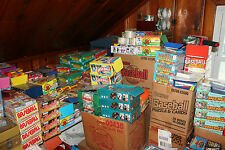 18 product ratings - Blowout Sale Of Unopened Vintage Baseball Card Packs From Antique Estate Sale! Trending at $33.95Trending price is based on prices over last 90 days. Increased chance to get more Dual-Lands!!! 2019 Topps Star Wars Resistance Complete Base Set 1-100 Kaz, Poe, Leia & more! This page was last updated: 25-Apr 22:46. Number of bids and bid amounts may be slightly out of date. See each listing for international shipping options and costs.